Provides essential building and set-up information for the entry level racer. Covers: Basic chassis design & fabrication tips, complete suspension set-up, selecting springs and shocks, front end alignment, scaling the car & adjusting weight distribution, working with spring spacers, setting stagger, adjusting the car to track conditions, actual track testing sessions, and more. For both paved and dirt tracks. DVD format only. 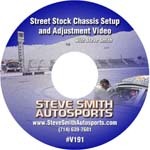 SPECIAL PACKAGE: Buy both the V191 video and S192 book together for only $62.95.